With no races in the books yet there are a multitude of unanswered questions. We’re likely to get some answers this evening, but with most riders just trying to get through the craziness of the first round in one piece, we could leave Anaheim with more questions than we had before the action even started! What we do know is, unless it rains, the riders will get to ride a mostly dry track. The track crew has done an outstanding job getting the racing surface in shape, and although it’ll probably be pretty soft in places, it’s not even close to the swamp it was just a couple days ago. Track walk is over, and we can confirm the track looks as good up close as it does from the stands. Yes, it’s soft in places—feet were sinking several inches without warning in a few spots during track walk—but it’s in absolutely amazing shape considering how much standing water there was just a couple days ago. It’ll probably break down fairly quickly and get pretty rutty, but it’s nothing that should cause a problem for the riders. As far as the track itself, it’s relatively basic, which is normally the case at the first round. There are two whoop sections, but they’re probably some of the easiest whoops the guys will face all year. In Tevin Tapia’s words, “The only problem is you could probably go too fast through these. [James] Stewart probably won’t even touch any of these with his front wheel.” There aren’t any extremely long rhythms, and two of the lanes are nearly identical. But don’t let the low degree of difficulty fool you, we should be in for some great racing tonight—fewer separators can lead to closer racing. Jessy Nelson was off to the lead right away but nearly lost it when he cased a triple. That allowed Jordon Smith to close up, but Nelson went back to work stretching it out. Meanwhile, after about a lap and a half, Cooper Webb was in third charging hard, passing Smith and taking second with thirteen to go. Nelson rode hard and maintained roughly a four-second lead for a while, but with five laps left Webb was all over him. Webb made the pass just before a triple, and Nelson bobbled, which prevented him from making the triple. Just like that, Webb had a gap and he completely checked out. At this point pretty much everyone was spread out and there just wasn’t much going on. Webb took the checkers with Nelson, Zach Osborne, Jimmy Decotis, Jordon Smith, Alex Martin, Colt Nichols, Joey Savatgy, Oldenburg, and Kyle Peters rounding out the top ten. Elsewhere Christian Craig and Savatgy got together, with Craig ending up having to pull into the mechanics area. Mitch Oldenburg also had a crash exiting the whoops while running sixth, losing spots to Martin and Nichols. Kyle Cunningham and Chris Alldredge were both limited by crashes too. Justin Barcia kicked it off by edging James Stewart for the lead, and a few turns later Jason Anderson took second away from Stewart. The three of them were super close, all right next to each other for a few turns, with Stewart getting back by Anderson. Ryan Dungey lurked in fourth, with Chad Reed right on him. Then Stewart cut down hard in a corner right before the finish line while Dungey was coming in hard on the inside. Dungey had nowhere to go and Stewart smashed into him and hit the deck hard. Dungey stayed up but Stewart was hurt and the red flag came out. Stewart was taken out on the Asterisk Medical Mule and the gate was reloaded for another twenty laps. On the restart it was Cole Seely and Eli Tomac, but somehow Barcia shoehorned his way into second ahead of Tomac. Ken Roczen found himself in second to last, with only Marvin Musquin behind him. Not much was going on inside the top six until Trey Canard came up the inside of Dungey and bumped him. Dungey crashed, losing about three spots while Canard went after Tomac and jumped by him in a rhythm. Canard was absolutely flying and it wasn’t long before he got by Barcia for second. Then Jason Anderson caught fire, passed Barcia and reeled in Canard! Anderson passed Canard and went on to start setting some crazy fast laps. Several spots back it was chaos as Dungey passed Reed, then they both passed Barcia. 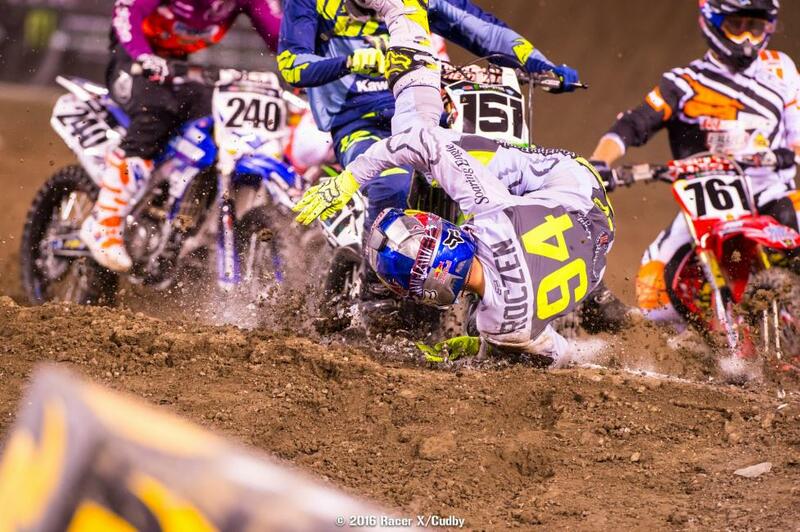 To add to the craziness, Ken Roczen had rebounded and also went by Barcia. Up front Anderson was reeling in Seely, who’d been riding the whole race in solitude. Anderson continued to take sizable chunks out of Seely’s lead, and with seven to go Anderson made a clean block pass and took the lead. Anderson’s pace was just out of control, and in no time he’d built a huge lead over Seely. Dungey also turned it up a notch and on the final lap he caught and passed Seely to take over second. Anderson would end up winning by a large margin, followed by Dungey, Seely, Tomac, Roczen, Reed, Canard, Millsaps, Wilson, and Brayton holding down the top ten. Big credit to Roczen, who came back for fifth after starting off in nearly dead last. Anderson’s win was a shocker, but for a while it looked like his old 250 rival Cole Seely was going to take it. All hail the sophomores! Seely grabbed the lead early in the main and then pulled a big gap of five seconds, but once Anderson was into second and rolling, Seely couldn’t stop him. This didn’t even need to go down to the last lap like it did often in their 250 days! 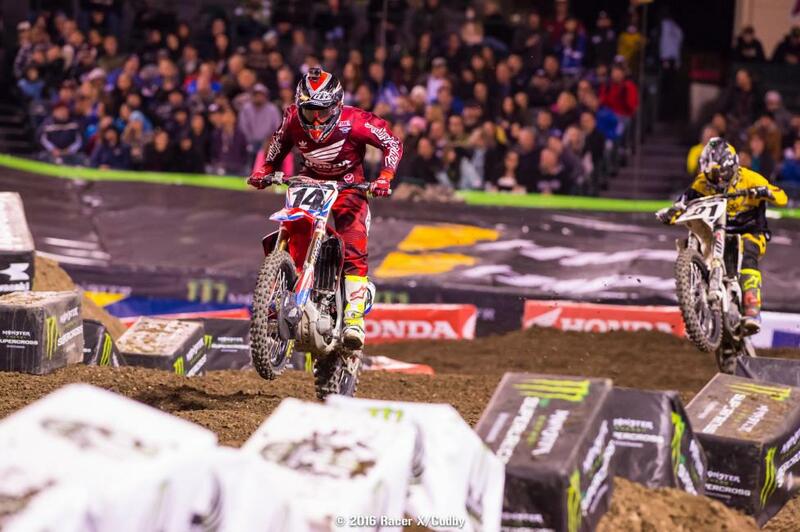 Seely was then passed on the last lap by Ryan Dungey, relegating him to third. After the race Seely was okay with it, though, saying he was super nervous all day, and even got to the point where the nerves gave him a stomach ache. Everyone was dealing with first-race jitters, as per usual. Tons of troubles for some other contenders, but they salvaged results. Dungey went down after Trey Canard put an aggressive pass on him, but somehow rallied back to second. Ken Roczen was down off the start and began the race in 21st, and somehow rallied back to fifth. The results don’t even tell you how crazy the night was for these two. Dungey crashed in his heat race and had to go to the semi, and Roczen had it even worse after a massive and scary first-turn crash in his heat. Luckily both guys were okay. Sandwiched in fourth? A quiet night for Eli Tomac, who wasn’t very happy with the way he rode. 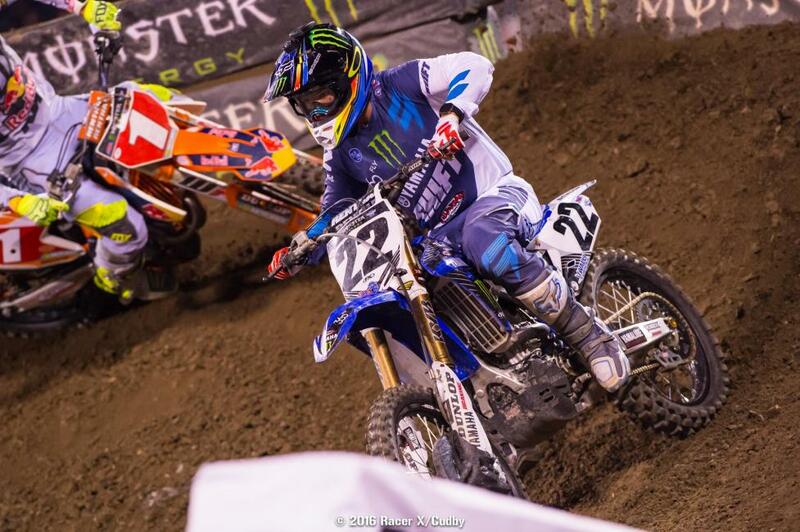 Behind Roczen came Chad Reed, but while the result was only so-so he still looked pretty good on his new Yamaha. We talked to Yamaha racing boss Keith McCarty and he said that while the team was only officially announced this week, Reed was able to test with the factory Yamaha guys for most of the off-season, anyway, just in a somewhat limited capacity since budgets weren’t set. Was the bike really ready? “We’ll find out,” said McCarty. It looked solid from our vantage point. Trey Canard looked like a favorite on his Honda HRC machine, topping qualifying and winning his heat. 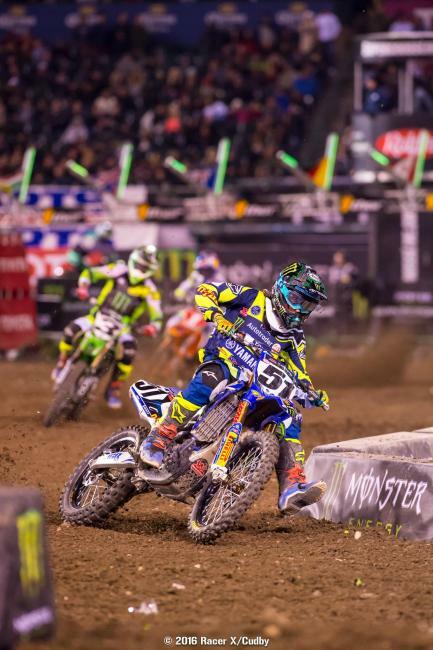 In the main, he quickly charged up to second behind Seely, but then Anderson got him. Canard was alone in third until he crashed, relegating him to seventh. In the 250 class there wasn’t as much of a story, only because everyone expected Cooper Webb to win, and then Cooper Webb won. There was a challenge, too, because Jessy Nelson, last year’s Anaheim 1 250 winner, got the lead early and pulled a four-second gap before long. Webb was a freight train once things started rolling, though, and he ate up Nelson’s gap and then took the lead. Nelson was a solid second and Rockstar Energy Husqvarna’s Zach Osborne started the season with consistency in third. After the race Webb told us until about a week ago he’d planned on racing 250SX East, and that he wasn’t as prepared as he’d like to be. It certainly didn’t show! Anything else? Oh yeah, THE FIGHT! In a collision course of personalities, Weston Peick and Vince Friese battled in a literal sense on the track. 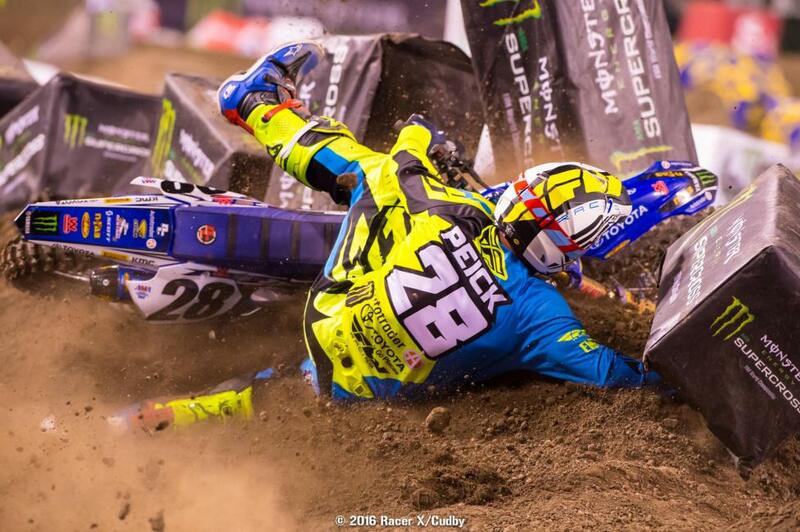 In a heat race Friese gave Peick an elbow and Peick hit a tough block and went down. In the Semi Peick made a pass and gave Friese a look, then Friese took them both down in a blatant takeout. Peick was furious, so instead of getting back on hisAutotrader.com/Monster/Toyota Yamaha, he started raining punches down on Friese’s helmet! Then he gave Friese a shove and flipped him off! No attempts were made to get back on the bike until after that, so the AMA and FIM told Peick he was disqualified for the night, and also again for next weekend’s race in San Diego. He was also fined $5,000. No penalties for Friese. We went to the JGR pits afterward but Peick declined to comment. Somehow things keep getting worse for Yoshimura Suzuki’s James Stewart. He was having a quiet night until early in the main event, when he was battling Anderson for position and tried to cut down in a berm. Well, Dungey was right there on the inside and they collided hard in incidental contact. Stewart appeared to be knocked out from the crash, and the main event was red flagged. After a few minutes, Stewart got up, and was transported to the pits on the Asterisk mule. His night was over, and we’ll wait for word on his condition. When the red flag came out for Stewart on lap two, Autotrader.com/Monster/Toyota Yamaha’s Justin Barcia was in the lead. He didn’t quite get the same level of start when they restarted the race, but he elbowed his way into second. Barcia stayed there for six laps, then started dropping backward big time and even had a little crash, ending up all the way back in fifteenth. Barcia told us he got super tight and suffered from arm pump.